What is ‘Made in Africa’ evaluation (MAE)? It is not what most people think. In order to move forward, it is time to come to some common understanding that can inspire and guide us into the future. Let us take it step by step. In 2007 Sulley Gariba – first IOCE President, a former AfrEA President and former Ghanaian ambassador to Canada – and I shared with each other our concern that the randomised control (RCT) movement among development economists that was gathering momentum in Africa did not reflect African philosophy and ways of seeing the world. RCTs at the time were extractive, based on simplistic understandings of the interlinkages among people and societies, focused on simple interventions without consideration of the larger contexts, treated people and communities as laboratory experiments, and tried to control actions in often fragile contexts. RCT methodology appeared not to respect African societies’ communal approaches, intricate relationships, and complex ways of knowing and communicating. We were concerned that a too-strong focus on RCTs would shift attention away from the complex, intractable problems that developing countries had to deal with and that required systems-based solutions, towards a concern with overly simplistic solutions that would in the end prove to be unsustainable and counter-productive. As a result, Sulley and I organised a Special Stream of discussions funded by NORAD At the 4th AfrEA Conference in 2007 in Niamey, Niger. More than 100 conference participants attended the day-long session, which we called Making Evaluation our Own – a concept that still resonates strongly with some of us. We were able to bring a Centre for Global Development (CGD) representative (who was driving the RCT movement at the time) to interact with a group of international and African experts. Michael Quinn Patton, Bob Picciotto, Jim Rugh, Donna Mertens, Fred Carden, Rob van den Berg and Nancy MacPherson were among the international speakers, and still remain some of African evaluation’s staunchest international friends. This led to a Special Stream Statement drawn up at the end of the day by a small group of African volunteers. It is worth reading here, in particular the motions proposed to, and accepted by the closing plenary of the conference. In spite of earlier meetings that expressed the need for more indigenous foci by African evaluators, I believe that this meeting at the Niamey conference is the genesis of what is today known as Made in Africa Evaluation. The Special Stream Statement started to formulate this focus. It requested the African evaluation community to re-examine the paradigms that guide evaluation practice on the continent. It formulated and justified the notion of Africa-rooted and Africa-led M&E based on: (i) the recognition of the importance of African values and worldviews and their central role in guiding and shaping evaluation in Africa; and (ii) the fostering of intellectual leadership and capacity in evaluation in Africa for a greater role in guiding and developing evaluation theory and practice. It encouraged the African evaluation community to take a number of steps: develop academic centres, establish mentoring strategies, develop evaluation theory and methodologies in Africa, publish more, and initiate an African evaluation journal. After the conference, momentum was lost. Good African evaluators were overworked; academic or research centers in the field almost non-existent, and other priorities moved to the fore. In spite of some informal discussions at subsequent conferences, and the commitment and efforts of key members of evaluation associations such as Issaka Traore, who is not with us any more, it was only in 2012 that another formal initiative was launched to move the idea forward. Sulley and I facilitated a proposal that led to the African Thought Leaders’ Forum on Evaluation for Development in the famous Bellagio Centre in Italy, supported by CLEAR-AA, AfrEA and the Rockefeller Foundation. Here the concept of Africa-rooted and Africa-led evaluation was discussed and documented in greater detail. As a result, the African Evaluation Association (AfrEA) Board in 2013 coined Made in Africa Evaluation (MAE) and developed a MAE strategy. Although this strategy was never fully implemented, some important activities flowed from it, in particular the African Evaluation Journal (AEJ) and several AfrEA conference sessions facilitated and supported by CLEAR-AA. In 2016, the Bill and Melinda Gates Foundation commissioned Bagele Chilisa of the University of Botswana to produce an in-depth scene-setting publication. Other interested persons also started to share their ideas in publications, with Fanie Cloete from South Africa in particular contributing important insights – see his very good series of blog posts here and informative publication here. MAE was also a focus in the Development Evaluation Training Programme in Africa (DETPA) of CLEAR-AA, and most recently a critical cornerstone for important discussions initiated at the 8th AfrEA Conference in Kampala, Uganda, about a potential South-South Collaboration in Evaluation coordinated by the five regional evaluation associations (VOPEs) in the Global South. However, debates continue in the African evaluation community about the nature and relevance of Made in Africa Evaluation today. 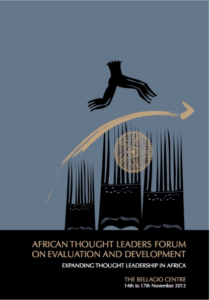 The concept remains unclear to most, and some outright reject the notion that evaluation in Africa is or should be different to that in any other place in the world. The next post in this series will aim to contribute to this discussion. Thanks for initiating another interesting topic, which is an emerging area. I look forward to the subsequent articles. Do you have a copy of the Bagele Chilisa’s synthesis report supported by Bill and Melinda Gates Foundation ?? I had a glimpse of the presentation in Uganda ‘ the African Three concept’ e.t.c. I hope we can have access to the report. Bagele’s paper will be referenced in my next post. You are right that it is informative reading and should be publicly available. I believe AfrEA is about to upload it on their website.